Got Pie? 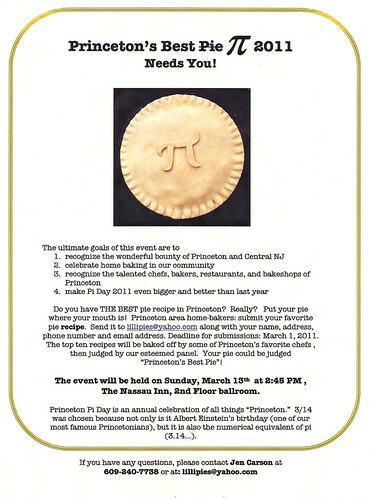 As part of the 2011 Princeton Pi Day festivities, there is a pie-judging contest. That takes place at the Nassau Inn on March 13, and your’s truly will be judging along with several other local culinary “luminaries”! Home bakers should submit their family favorite pie recipe by March 1 to lillipies@yahoo.com. Selected pies will be prepared by a local restaurant (see below), and judged by the panel (also below). Get your Pie on now! The restaurants and bakeries participating in the contest are: Butter Lust Bakery/Small World Coffee, Whole Earth Center, Main Street Bistro, Bon Appetit, Witherspoon Grill, McCaffrey’s, D’Angelo’s, Mediterra, Eno Terra, and the Witherspoon Bread Company. Judges are: Pat Tanner, Faith Bahadurian, Fran McManus, Diane Landis, Pam Parseghian, and Victoria Hurley-Schubert. $314 donated to the Princeton School Gardens Cooperative in the winner’s name (provided by Princeton Tour Company) AND a year of Bent Spoon Ice Cream, a different flavor each month! « Save Our Whoopie Pie!